Join us for an authentic Ecuador rainforest experience with the native people whose ancestors have lived on this land for more than 400 years. Preserving rainforest with the adventure of a lifetime. This is a unique and exciting way to preserve tropical rainforest. Please click the story link to learn about the eco-tour schedules and costs. The villagers put you up, feed you tour you and show you a true lifetime experience. All of the tour profits go directly to the rainforest villages involved, preserving appx. 25,000 acres per village. The villagers are able to turn away the big mining, timber and oil companies to maintain their ancient way of life on a sustainable and permanent income, with no need for these giant corporations and their ecologically destructive explotation of rainforest jungle. Booking in now will allow you to take advantage of record low air fares currently being offered by the airlines. If you are not able to make one of the eco-tours anytime soon, you can also make a US Federally tax deductible donation to assist this unique program for preserving real pristine and virgin rainforest jungle. No amount is too small and proceeds go directly to the rainforest villages to assist them in preserving true equatorial rainforest. The article lays out the itinerary for the last tour of 2009, and it's huge. 14 days of non-stop fun and adventure. There are only 3 spots left for this big tour, and airline ticket costs are at an all time low. People are reporting round trip fares of around 500 bucks. The 2 week tour is only 850, so it's a great deal all the way around. Of course the greatest part of the deal, is helping local villages preserve huge chunks of rainforest from greedy international corporations who ruin these jungles through commercial exploitation. Many of you have seen the photos of what the oil companies have done in Ecuador. The mining and timber companies are no better. If you can't go, please think about tossing a few bucks in as a donation, because every penny counts. If you can go, beat these recession blues and have an adventure that will provide you memories for a lifetime. If you like to watch wildlife and take photos, this is your deal. Playa de Oro is the only Margay preserve in the world, and all other sorts of wildlife and tropical birds abound! You will be accompanied by Grace Lush and/or Tracy Wilson, both awesome and fun people!! .. I promise you that. What a great idea for you people in America. This would be the vacation of a lifetime! Great idea...I would love to do this tour but unable to afford at this time. Thanks for sharing Simone and Patrick. It's more than a tour or vacation. It's basically a method to support a cause. Preserving rainforests in tough economic times, when grants and donations are getting thin. If you are unable to go (like me, lol) feel free to assist in promoting this working solution of preserving rainforest, to other folks. Since I am not able to actually go there, I will indeed support this project by getting the word out, a donation when I can, and keeping NWHS involved with whatever support that can be mustered through that org. Also, it's fascinating to watch as this program grows and continues to save areas of tropical jungle for the wildlife and local inhabitants. Thanks for the Noteds and comments. Feel free to add any questions you may have about this program. Will spread the word ! sounds like a adventure, would love to do something like this. its good strategy for supporting people that have habitat in the rainforest and still provide the natural preservations of this beautiful place. This is the type of travel that I could get behind--responsible tourism where you help the indigenous people and the wild places of the world instead of being a prime cause of harm to an environ. Bless you Patrick for putting this out there, alas I can't afford to go either but I certainly will send this around TY Simone for the forward of this great story. Indeed, it is sustainable as a source of revenue for the villagers. None of the support orgs take any cuts. The villages have their appx. 25,000 acres of allotted forest, and can choose how they wish to utilize it. Some may sell off rights to timber, mining and oil companies who will put big bucks on them up front. But, when that money is gone and the forest toxic, they are then without a home. If they themselves clear cut it, and farm it, eventually they run into the same problems. Using non-invasive eco-tourism, the villages can keep their allotted forest pure and pristine, while showing visitors the importance of rainforests. It is also in their best interest to diligently protect and maintain the endangered and threatened species in the forest, because many visitors have an interest in viewing these species (be it birds, mammals, insects or even plants). Protecting the interests of the habitat and the wildlife there, serves to protect the villager's future interests as well. Works out great for everyone (including the wildlife). There are 3 more trips left this year, with only the last one having any openings left (3). So, it's working well! If you can't actually get there, please consider any donation to this "real deal" preservation project. It's an opportunity to support a rainforest preservation project that actually saves real rainforest! What an awesome experiance this would be! Thanks for sharing with us! Great! this is a good start to save what we already have in our hads of our earth. Thank you so much Patrik. Sounds like an awesome adventure. Thanks for sharing Patrick. Tks Patrick, sure sounds like a wonderful dream adventure for everyone that can go! Adventure is the key. You only live once, so why not set aside some time, get away from the internet, the work-a-day, the phone etc., and see a reality that others only dream about..
And.. help save a big chunk of virgin rainforest. If the villagers there can dedicate themselves to keeping this place as God intended, then we can certainly extend a hand and assist. If you can't go, just send a bit of help their way. They see every penny, and no one takes a cut in the middle. Oh, as far as the movers and shakers on this deal, it's definitely big Kudos to Tracy Wilson and Grace Lush who give up their time to go there and guide people through this amazing experience, time and again. They have boundless energy and believe in this cause with their entire being. thanks so much.You made me get a new dream in my mind. Thank you Patrick for sharing this..
That,s just fantastic, Patrick. Thanks so much for sharing this with us. tHANK YOU FOR THE GREEN STAR, BUT ,,, I STILL FEEL THE SAME SWEET. This News post has probably now ran out of steam, but I appreciate all those that posted and/or passed the story on to friends here at Care2. Maybe some even passed on to friends offline. I realize there are 100s of news articles posted daily at Care2, so I am quite pleased this one found it's way to Front Page. I like to post "good news" because in the world of wildlife and environment, good news is sometimes hard to find. I am very proud of the NWHS association with Touch The Jungle, and dearly hope many others see the value of this program and the seeds of success that are growing. That charter lies with those who become aware of this program (like you), and other programs like it. I also would like to extend thanks to Earthways Foundation, who provided original start-up assistance and continues to help solicit and distribute donations (forwarding 100% of those funds to the actual rainforest villages). While many rainforest preservation "advocacy" organizations work for outreach and education, Touch The Jungle is in the real rainforest securing real jungle for real protection and preservation. 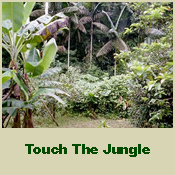 While some nonprofit orgs "talk the talk", Touch The Jungle "walks the walk". So real, that you can go there and see this fine work with your own eyes (ears and nose). It's sad that the small orgs and programs like Touch The Jungle and NWHS get no attention/assist from large media and proponents of wildlife and habitat preservation. We can't buy ads, as we choose to spend all donations on real wildlife, real rainforest and real wildlife programs. Us "little guys" rely on people like you to spread the word outside the boundaries of giant media and enormous orgs, and to assist financially in any small way. I add this last post, surmising that this News is now considered "old news" and will probably see no more attention here at Care2. There will however, be a news article recapping the next field report on the happenings on the next eco-tour, and hope we have stirred enough interest for folks here to want to read what occurred. Saving real rainforest, we are on the move and continue to do this work. Thank-you for your interest. Feel free to be a part of it.